In a paper published August 7 in the journal Physical Review Letters, he and two other theoretical astrophysicists at UCLA—Alex Kusenko and Volodymyr Takhistov—offer another means by which stars could have produced these heavy elements: tiny black holes that came into contact with and are captured by neutron stars, and then destroy them. Tiny black holes are more speculative, but many astronomers believe they could be a byproduct of the Big Bang and that they could now make up some fraction of the “dark matter”—the unseen, nearly non-interacting stuff that observations reveal exists in the universe. 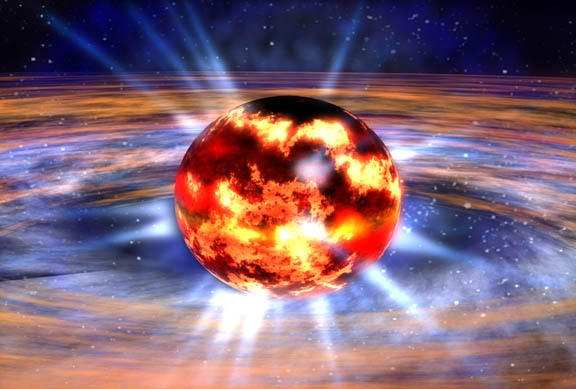 “As the neutron stars are devoured,” he added, “they spin up and eject cold neutron matter, which decompresses, heats up and make these elements.” This process of creating the periodic table’s heaviest elements would also provide explanations for a number of other unresolved puzzles in the universe and within our own Milky Way galaxy. “They are a distinctive display of infrared light (sometimes termed a “kilonova”), a radio emission that may explain the mysterious Fast Radio Bursts from unknown sources deep in the cosmos, and the positrons detected in the galactic center by X-ray observations,” said Fuller. “Each of these represent long-standing mysteries. It is indeed surprising that the solutions of these seemingly unrelated phenomena may be connected with the violent end of neutron stars at the hands of tiny black holes.” Funding for this project was provided by the National Science Foundation (PHY-1614864) at UC San Diego and by the U.S. Department of Energy (DE-SC0009937) at UCLA. Alex Kusenko was also supported, in part, by the World Premier International Research Center Initiative (WPI), MEXT, Japan.